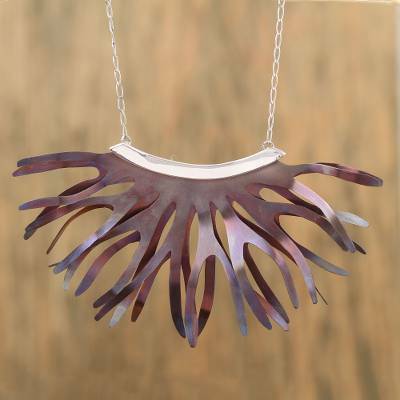 Artisan Crafted Titanium Pendant Necklace from Mexico, "Dragon Betta Fin"
Inspired by the fins of dragon betta fish, an elegant shape is handcrafted of titanium with a glimmering plum finish. Mexican artisan Diana Solis enjoys working with titanium, inspired by the ease with which she can alter the metal's colors and hues. This pendant necklace is accentuated with sterling silver, adorning the wearer on Cuban link chain. You can find titanium pendant necklace 'Dragon Betta Fin' by Diana Solis in jewelry categories such as No Stone Necklaces, Silver Necklaces, Sterling Silver Necklaces, Titanium Necklaces and Pendant Necklaces. Enjoy exploring these sections for other Novica treasures. "My work is guided by my motto, 'Keep tradition alive, it must not get lost, but it can be modernized and it must be offered to the younger generations so they can learn them.'" "I am passionate about my work - it's fascinating because it expresses the best of who I am. And I am so demanding of the quality of my work, that it makes me go after the best techniques in my line of work. "My love for jewelry began when I was a little girl thanks to my father who as a silversmith provided for our numerous family – we are nine children. So it feels like this is something that runs through my veins. "I'm always eager to learn more about my craft. I developed my skills working at different workshops but also on my own so I could create my own designs. My father was a great teacher who taught me all there is to know about this art and its tools. "I set up my own workshop in 2006, and I've gradually been acquiring the tools and equipment that I need to craft my own designs. "I've also enjoyed crafting jewelry by hand as well as the different procedures such as mixing the alloys; we also make our own wires for the knitted pieces. It gives me a great sense of satisfaction seeing a finished piece, especially if my design is quite laborious to make. I enjoy the challenge of crafting my designs. "My inspiration comes from the ideas that may come to mind and sustain my own unique style. My greatest challenge has been establishing my own workshop and teaching my relatives so that this art form continues to live in our souls. We do this in honor of my mom and dad, who have passed away. "It s thanks to my parents’ encouragement that I've gone after my dreams and make them come true, like being able to create work opportunities for my relatives as well as for artisans in our community. I teach them, and they teach me. I listen to their proposals and in that way we really work together as a team. My colleague introduced me to Novica and I am so glad he did. The needle pendant necklace from Diana is absolutely stunning. It is modern, sleek with an exceptional quality. I wear it almost everyday, it has an edge to it yet it is very classic and can be worn in a very conservative work environment. I was a little bit skeptical at first with the Novica concept, but now I am hooked, such an amazing talent, Thank you Diana.